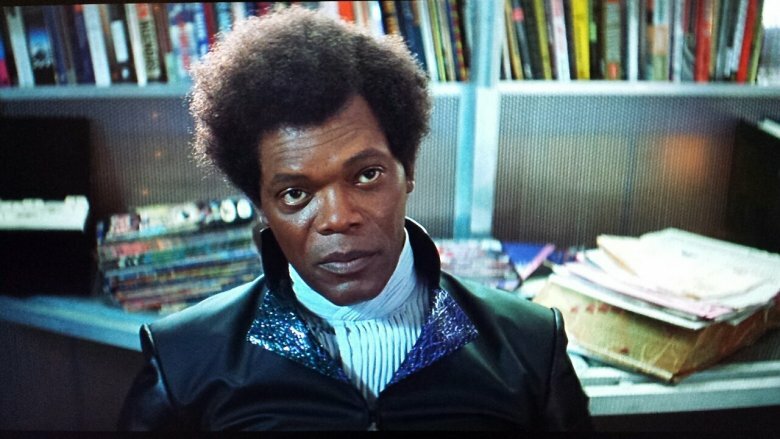 M. Night Shyamalan's Glass, the follow-up to his unconventional 2000 superhero origin story Unbreakable, was once a fan's what-if, a perennial prospect of the "wouldn't-it-be-cool" variety. Now, the movie is actually, really happening—and there's proof. The movie officially kicked off production in and around the Philadelphia area at the beginning of October, and is now entering the final stretch of a 39-day shoot. It took a little while, but the first set photos have finally emerged, showing off Samuel L. Jackson's return as Elijah Price, also known as the nefarious and cunning terrorist Mr. Glass. The images show the 68-year-old actor still maintaining his character's sense of supervillainous style, sitting in a wheelchair in the open air. Considering the death toll he racked up in his first appearance, it's a little bit of a surprise to see him out in the open and in his own elaborate wardrobe, considering the coda at the end of Unbreakable put Elijah's fate in a facility for the criminally insane. It's possible, of course, that he's in the yard of a particularly lenient asylum. Regardless, considering the movie shares his name, it's certain he'll play a huge role in the story, free man or not. Glass is a sequel to both Unbreakable and Split, Shyamalan's surprise hit 2016 thriller starring James McAvoy and Anya Taylor-Joy. If you recall, that film ended with a classic Shyamalan twist, revealing the return of Bruce Willis as Unbreakable's David Dunn and setting up a conflict with James McAvoy's multiple-personality villain, the Horde. Glass, which Shyamalan says he has been wanting to make for years, combines the two stories into one climactic showdown. In addition to returning actors Willis, Jackson, McAvoy, and Taylor-Joy, Sarah Paulson of American Horror Story will also be featured in the cast. Glass will be out in theaters on January 18, 2019.